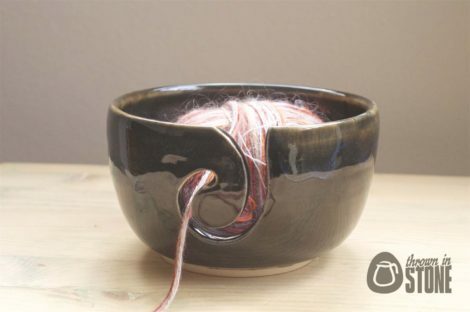 This ceramic yarn bowl was hand thrown on my potters wheel using strong white stoneware clay. The slit to thread your yarn through was carved out of the bowl whilst still damp. 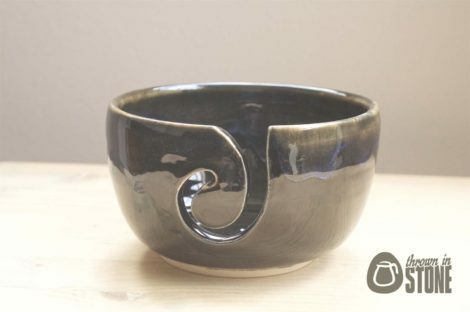 After being fired in my kiln the bowl was glazed in combination of glossy black, toffee tan and blue reactive glaze dripped down the rim giving a subtle variation. All of my handmade pottery will be well packaged prior to shipping, I’d hate for anything to get damaged in the mail. Happy to combine shipping, post worldwide and all of my items are made and ready for immediate dispatch.